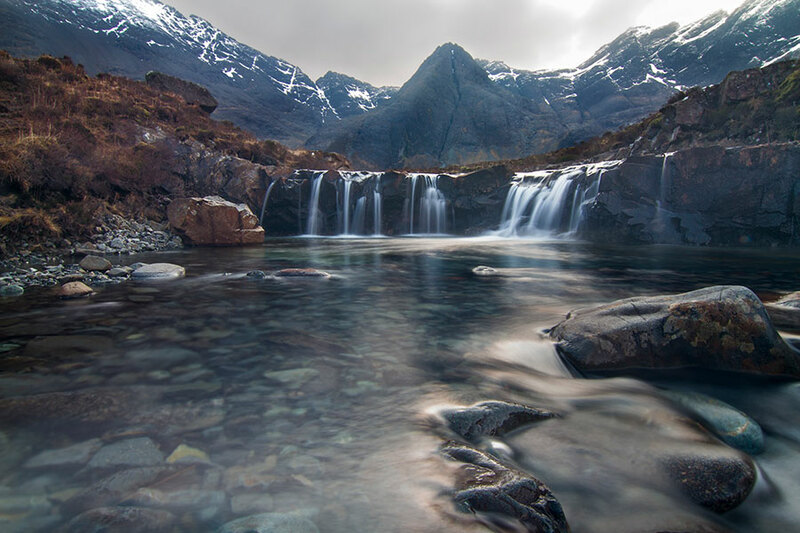 Nestled at the foot of the imposing Black Cuillin mountains are the famous Fairy Pools, a succession of crystal clear pools fed by a series of small waterfalls. Visit on a sunny day and the temptation to take a dip in the beautiful blue water will be all too strong. Look out for two pools connected by a natural underwater arch for a unique wild swimming experience. Getting there: The route to the Fairy Pools is a simple out-and-back walk from a Forestry Commission car park, which involves a couple of easy river crossings over stepping stones. It takes approximately 20 minutes to reach the first of the pools. Park in the Forestry Commission car park, signposted ‘Glumagan Na Sithichean’, which is located along the single track road from Carbost to Glenbrittle. 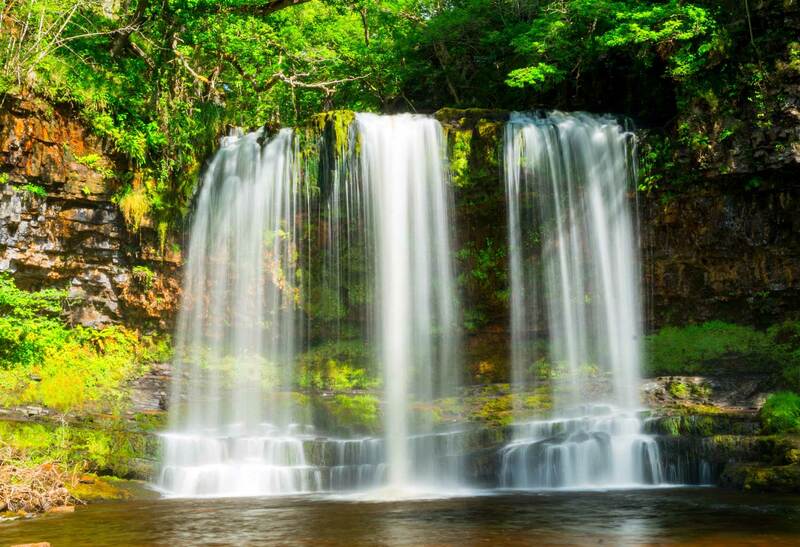 Known as ‘waterfall country’, this corner of the Brecon Beacons national park is said to have the greatest concentration of gorges, caves and cascades in Britain. A five mile route takes you to four impressive falls, including Sgwd-yr-Eira, a thundering curtain of water that you can actually walk behind. 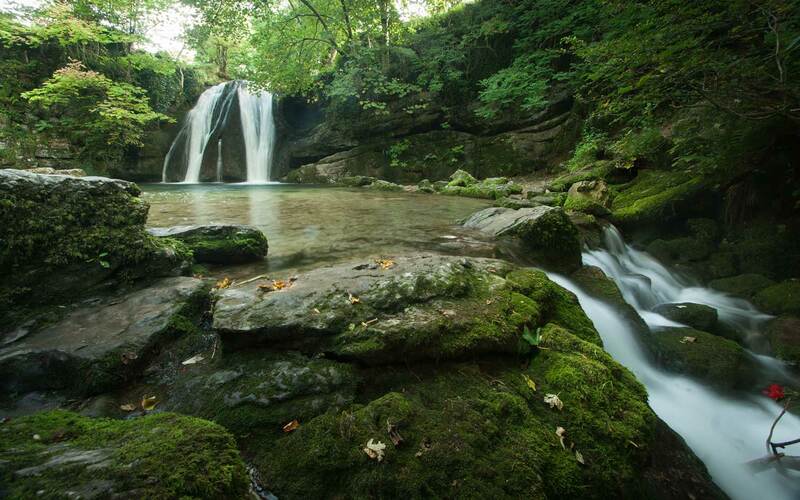 Getting there: A well-marked 5½ mile trail from Gwaun Hepste car park will lead you to the four falls of Sgwd Clun-Gwyn, Sgwd Isaf Clun-Gwyn, Sgwd y Pannwr and Sgwd-yr-Eira, which are all individually distinctive, yet equally impressive. Steall Falls is Britain’s second highest waterfall, plummeting 120m into the River Nevis. It is a truly majestic sight, reached by walking through the lush forest of the Nevis Gorge, before opening out into the Steall Meadows, where you get your first glimpse of the fall. It wouldn’t be a real visit to Steall without getting close enough to catch a face-full of spray. This means crossing a famous swaying cable suspension bridge over the river to reach the foot of the falls. Getting there: From the car park at Glen Nevis road end, head east into woodland on a path climbing above the Steall Gorge. Cross burns, streams and a bridge until you emerge into Steall Meadows. Continue ahead to cross the wire bridge to the falls. Retrace your steps to return to the start. Steall Falls are about two miles from the car park. 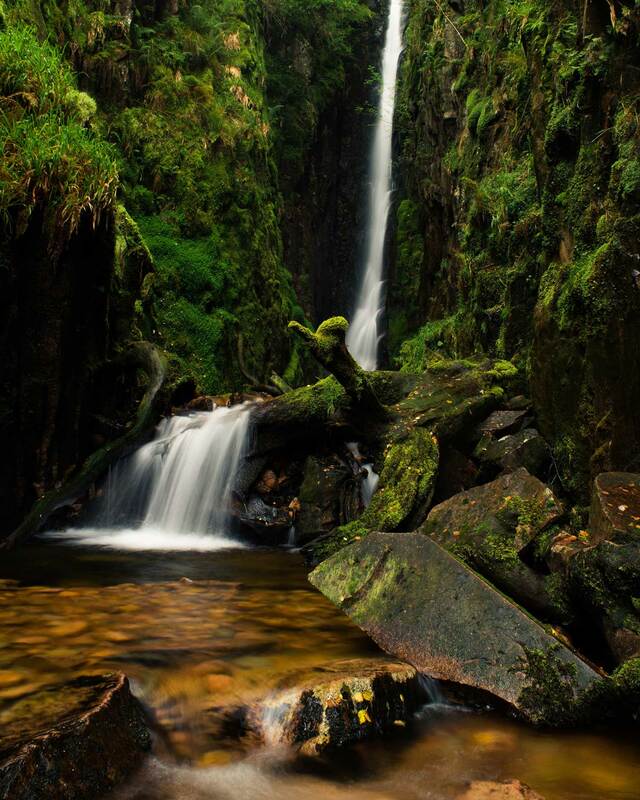 Deep in a gorge between Red Pike and Crummock Water is Scale Force, the Lake District’s highest waterfall. With three distinct falls that tumble gracefully down the rock all year round, it remains an impressive spectacle even during dry periods. Lakeland poet William Wordsworth described the setting as ‘a fine chasm, with a lofty, though but slender, fall of water’. Getting there: From the village of Buttermere, head along the western edge of Crummock Water and follow Scale Beck to reach Scale Force. From here you can continue on to climb Red Pike, before dropping down to Bleaberry Tarn, then back into Buttermere. Park in Buttermere car park at the start of the route. These pretty falls are an often-ignored gem. They tumble alongside the Watkin Path up Snowdon, meaning you can visit the falls and climb Wales’ highest peak in one wonderful walk. Outdoor photographer and Instagram sensation Eilir David-Hughes (@Eilir30) has revealed this to be one of his top locations: ‘Winding its way through Cwm Llan and down to Afon Glaslyn, this little stream is one of my favourites. Snowdon towering above and multiple waterfalls make it very photogenic’. Getting there: From the Pont Bethania car park in Nant Gwynant (off the A498), follow the main road to the left from the car park over the bridge and cross the road. Take the signed Llwybr Watkin Path through the woods. Follow it through open countryside to reach the Afon Cwm Llan falls. For the energetic, continue up the Watkin Path to the summit of Snowdon (you’ll need a good map, compass and proper hillwalking kit for this), or retrace your steps back to the car park. This impressive waterfall gets its name from the natural cavern within which it is set. The 40ft falls have inspired many writers and poets, including Wordsworth. This walk isn’t only spectacular because of the waterfalls, but also offers a real taste of Lake District hillwalking at its best, with incredible views to boot. Getting there: The falls are located very close to the New Dungeon Ghyll Hotel in the Langdale valley. But you can make it a proper hillwalking day out by completing a big loop from the waterfall up Harrison Stickle, around beautiful Stickle Tarn and back down a series of stone steps alongside Stickle Ghyll, enabling you to take in a series of tumbling falls on your descent, not to mention panoramic views from the fell tops. Parking is available at the foot of Harrison Stickle in the Stickle Ghyll National Trust car park. This spectacular cascade is tucked in Lydford Gorge, an atmospheric chasm stretching one and a half miles into the hills. Local folklore says that the name of the waterfall comes from its resident ghost, a mysterious lady wearing a long white gown, who is sometimes still spotted by visitors. Getting there: This three-mile route starts at the car park in Lydford. Join the Lydford Gorge Trail and follow a gurgling Dartmoor stream to the Whitelady Falls. From here, drop down into the gorge, returning via the Devil’s Cauldron, an impressive whirlpool. You’ll hear the Devil’s Cauldron before you set eyes on it – and from a platform set above the pool you can admire the incredible force of the water in the dark ravine, which is covered in ferns and mosses. Be aware of the risks and hazards of wild swimming, especially near waterfalls and in cold water. White water is less buoyant, while moving water can be powerful enough to sweep you off your feet and pin you under the surface. Swimming in cold water also saps body heat. Test the water temperature before entering and wade in slowly to avoid ‘cold-shock’. Do not swim alone. For more information visit Wildswimming.co.uk and Outdoorswimmingsociety.com. Be prepared for walking in hilly or mountainous areas. Wear sturdy footwear and carry a rucksack containing food and water, waterproofs and warm layers, a torch, first aid kit, whistle and a mobile phone. Check the weather forecast before you set out. Carry a map and compass, and know how to use them. Ensure you are fit to undertake the walk, and always notify someone of your intended route and expected return time.